I was actually back from Brazil on Tuesday but, due to the vagaries of French air traffic control and baggage handling (don't ask - it's a long story) the suitcase and fishing tackle didn't get here until last night. Anyway - Brazil! This was was a holiday to visit our third son, his partner and her family so fishing was a bit limited. 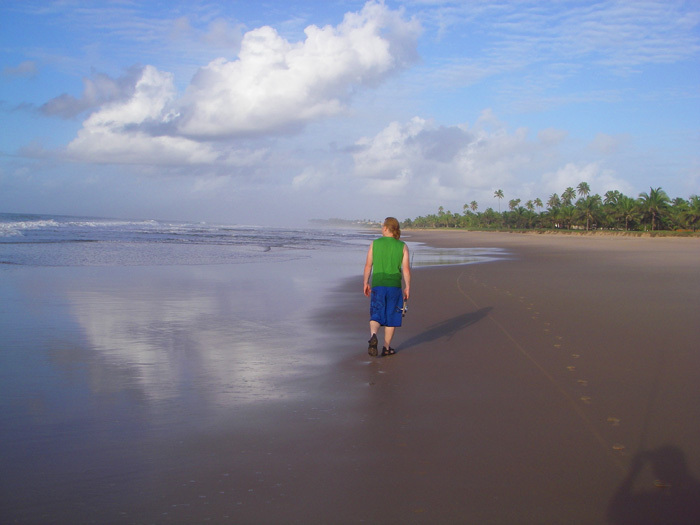 We were on the coast north of Salvador for most of the time and there were plenty of beaches for Richard and I to try - and try we did. Every morning, before anyone else was awake, we trudged for miles along the sand, spinning rods in hand. In fact when I say plenty of beaches I mean thousands of kilometres of beaches and WHAT beaches. Clean sand, virtually no people and constant heavy surf plus a howling onshore wind from the south east. 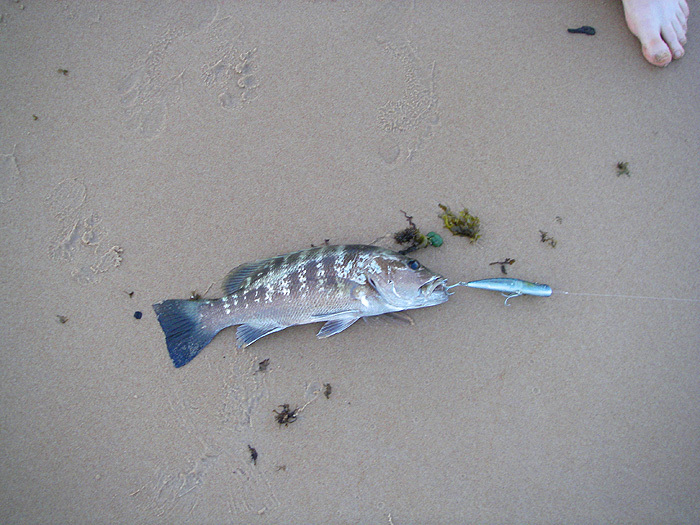 It wasn't easy to propel a lure more than a few metres out into the sandy coloured sea. We'd hoped for snook and/or jacks , both of which occur there but in two weeks we saw one tiny jack blitz that lasted for a few seconds and visited one village where the locals had caught a couple of small jacks on handlines and livebaits. 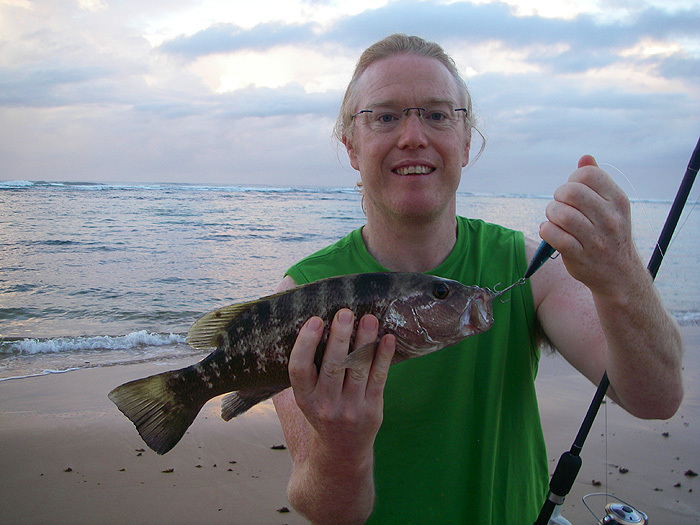 Our total catch in the two weeks was one grouper taken by Rich (smug little so and so). I never had a sniff. 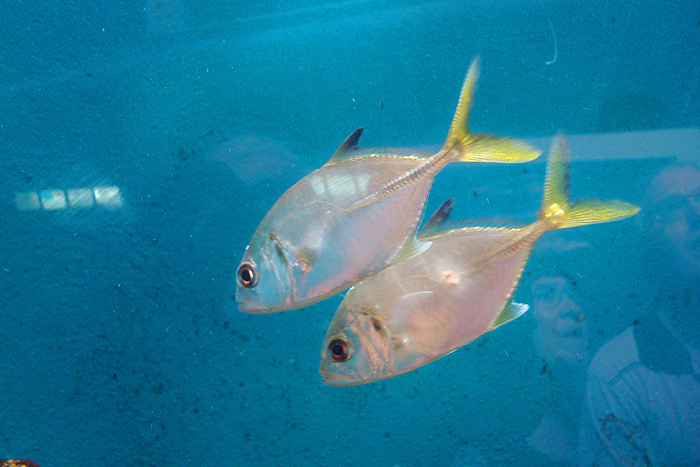 Tropical seas are not always stuffed with fish. We saw NO sea birds anywhere - that should have given us a hint and the only bait fish were at the spot where we saw the jacks caught in the shelter of a massive reef. Of course it was not a dead loss and we learned quite a lot in the course of our stay. Many of the locals fish for crabs to eat and others use small hooks and shrimp baits to catch tiny fish which they also devour. 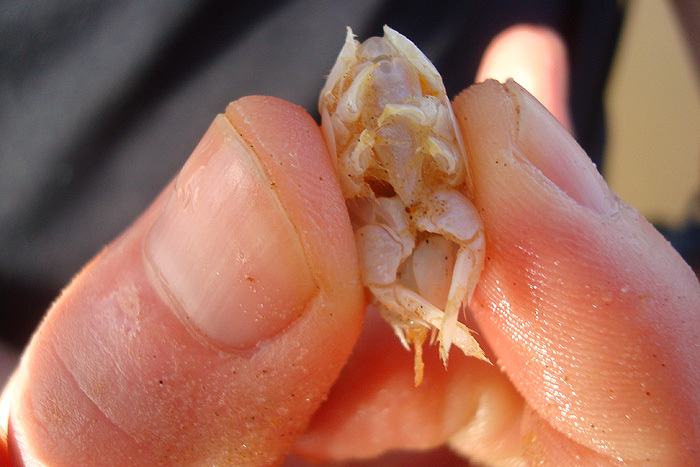 For years I've wondered how to find sand crabs (Emerita) for bait, these are the things they call 'sea cockroaches' in the Caribbean. This time we found out and it's easy. 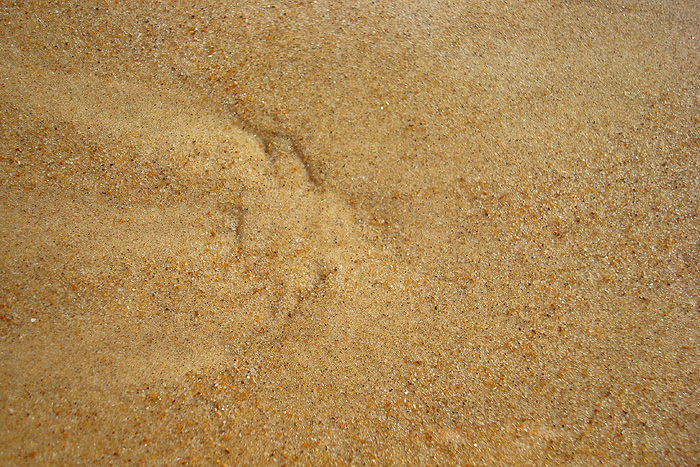 You look for a certain little mark in the sand, scoop your hand under it and bingo! You have to be a little careful because although these crustaceans are small they are a bit spikey. Anyway, next time I want some bait I'll know how to get them. As I said the sea was always rough but the fishing boats did land some fish and we saw (and ate) snappers and balao. 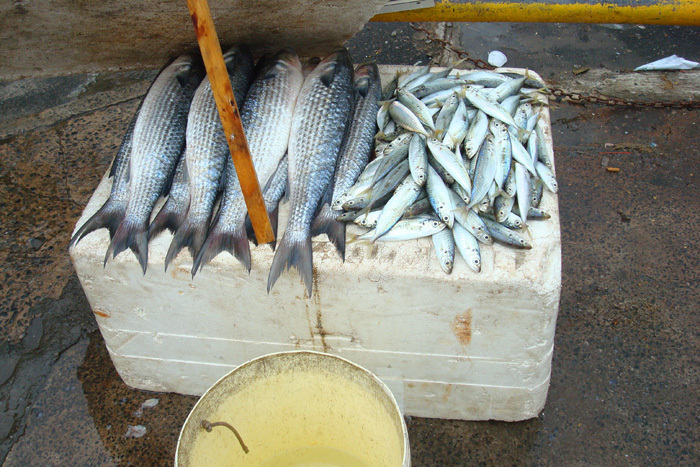 On one occasion there was a box of mullet and small mackerel like fish on the quayside so clearly both had potential. Anyway, perhaps next time we'll do better. I've set Richard the task of sorting out the bait fishing before my next visit. To our surprise along most of the coast there were shallow, freshwater lagoons and these contained fish but that'll have to be another story. 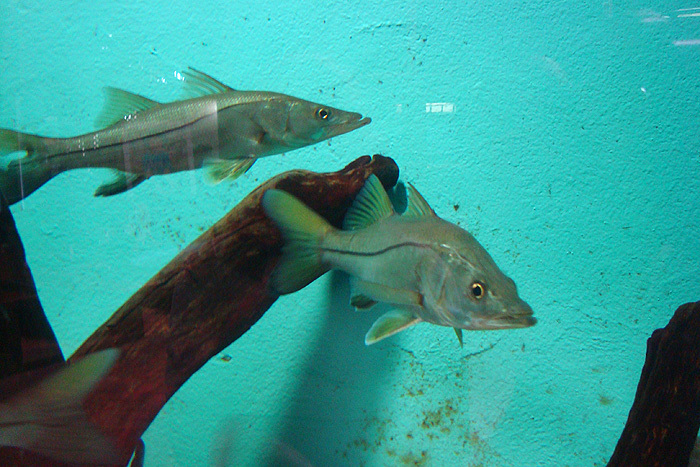 There are fish in Brazil.